The aim of this study was to determine the in-vitro anti-ROS and in-vivo anticancer activities of Tabebuia pallida leaves (abbreviated as TPL) against Ehrlich’s ascite carcinoma (EAC) cells. The crude ethanolic extract (CEE) (70% v/v) was fractionated successively with different solvents to get petroleum ether (PEF), chloroform (CHF), ethyl acetate (EAF) and aqueous fraction (AQF). The phytochemical studies were done by standard spectrophotometric methods. 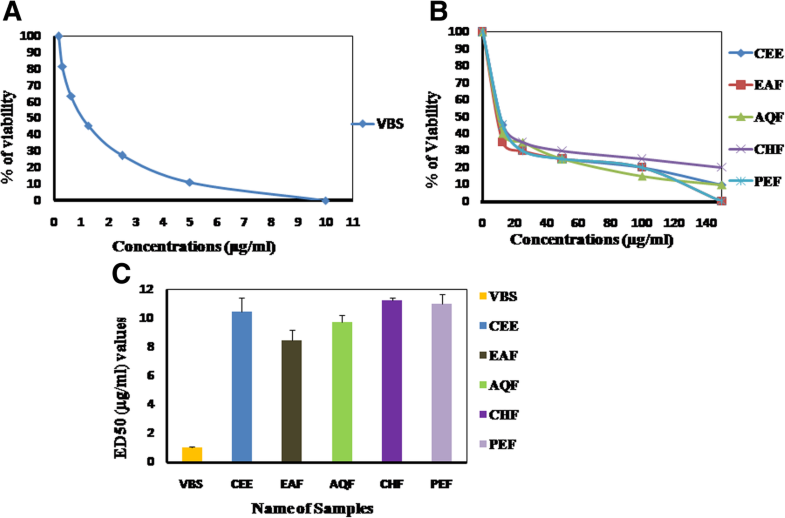 The in-vitro cytotoxic and in-vivo anticancer activity were evaluated against brine shrimp nauplii and EAC-induced tumor bearing mice, respectively. Among the extracts, the EAF showed the highest phenolic (158.17 ± 1.54 mg/g GAE) and flavonoid (5.43 ± 0.017 mg/g CAE) contents. The total antioxidant capacity of the EAF was 2.30 ± 0.080, which was higher than other extracts and the standard catechin (2.16 ± 0.038). The ferrous reducing antioxidant capacity was in the following order: AA>EAF > CEE > AQF > CHF > PEF. In DPPH and hydroxyl radical scavenging assay, the EAF showed the highest DPPH and hydroxyl radical scavenging activity with IC50 of 6 ± 0.25 μg/ml and 3.58 ± 0.28 μg/ml, respectively, when compared to the standard BHT (IC50 of 16.08 ± 0.28 μg/ml). Also, EAF showed potent inhibitory activity against lipid peroxidation with IC50 of 14.33 ± 0.14 μg/ml. A positive correlation (p < 0.01) between the total phenolics and antioxidant potentials as well as lipid peroxidation inhibition with the hydroxyl radical scavenging was observed. In addition, the EAF showed the moderate cytotoxic effect with ED50of 8.50 ± 0.70 μg/ml and significant cell growth inhibition (71.17 ± 0.44%) when compared to the standards and the cell growth inhibition was positively correlated (p < 0.01) with phenolic contents. 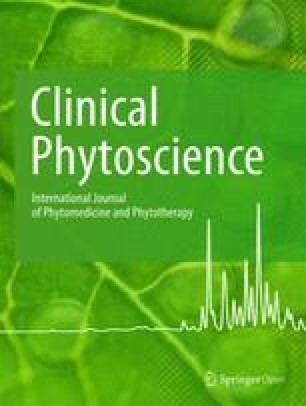 Our findings suggest that the leaves of T. pallida might be considered as a new natural source for antioxidant and anticancer compounds, which could be a potent and novel candidate for anticancer therapy. The online version of this article ( https://doi.org/10.1186/s40816-019-0111-5) contains supplementary material, which is available to authorized users. In the last decades, our understanding about the term “oxidative stress” (OS), an imbalance between the production and scavenging of reactive oxygen species (ROS) by a living system (e.g. cells), has been widened considerably .OS induced by ROS such as hydroxyl, peroxyl and superoxide radicals, have the tendency to become stable through electron pairing with biological macromolecules such as proteins, lipids and DNA in healthy human cells [2, 3]. Consequently, the formation of lipid peroxidation along with DNA damage and protein dysfunction leads to etiology of different diseases including cancer, coronary heart disease, neurodegenerative disorders, diabetes, arthritis, inflammation and lung damage [4, 5]. Moreover, the damages can become more prominent due to weakened cellular defense systems. All biological systems have antioxidant defense mechanism that protects against oxidative damages to remove damaged molecules. In many cases, this natural antioxidant defense mechanism can be inefficient; hence dietary intake of antioxidant becomes imperative. Antioxidants are secondary molecules or metabolites that act as ROS scavenger and activator of cellular antioxidative enzymes to prevent the damages induced by OS in biological system. Some synthetic antioxidants such as BHT, BHA, and tertiary butyl hydroquinone are commonly used in processed foods for preservation and elongation of shelf-life, but their unwanted toxic effects make them restricted to use . Hence, naturally occurring antioxidants from plant polyphenols are getting more attention in terms of practical usage as safe and potent bioactive compounds. It has been reported that the scavenging properties of ROS are mainly due to the presence of bioactive compounds such as, flavonoids, polyphenols, carotenoids and vitamin E and C [7, 8]. Therefore, the antioxidant enriched medicinal plants, fruits and vegetables may contribute to the protection from various diseases including cancer caused by OS . Cancer is a major cause of death throughout the world and the number of individuals living with cancer is increasing day by day. This is not only a problem of Bangladesh but also a global problem. Moreover, the currently available anticancer drugs have limited use due to its health-related other serious complications. It is therefore important to search a novel anticancer drug from other biological sources, which have fewer side effects. Over 60% of currently used anticancer agents are derived from natural sources, including plants, marine organisms and microorganisms . Among them, plants have a long history of use in the treatment of cancer. Out of 250,000 plant species worldwide, more than 3000 species have been reported to have significant anticancer potential . Over the past 30 years, approximately 45% of all anticancer drugs have been derived directly or indirectly from plant compounds, in which 12% are natural products and 33% are semi-synthetic derivatives of natural related products [12, 13]. Different types of cancer cell lines are widely used for the screening of anticancer agents from plant sources. Recently, researchers have focused on the use of Ehrlich Ascites Carcinoma (EAC) (transplantable tumour cells) cells, to investigate the anticancer agents from different plant species [14, 15]. Accumulating evidence suggests that EAC cells have been used as a model cancer cell line for the study of many plant species in cancer research. The in vitro and in vivo anticancer activity of black tea , honey , white mulberry , Syzygium fruticosum  and many others in EAC cells has been reported. These published evidences suggest that EAC is now a good model cell line to identify anticancer agents from plant species. Tabebuia pallida (T. pallida), a member of Bignoniaceae family, is commonly known as white trumpet tree. It is one of the species of the largest genera Tabebuia, distributed in northern Mexico, South to Northern Argentina, Caribbean Islands, Cuba, Chile and Paraguay [19, 20]. To the best of our knowledge, the in vitro and in vivo biological activity of T. pallida has not been reported. Therefore, we performed a detailed literature review on Tabebuia genus and found that a diverse range of secondary metabolites has been isolated (Additional file 1: Table S1) [21, 22, 23, 24, 25, 26, 27, 28, 29, 30, 31, 32, 33, 34, 35, 36, 37, 38, 39, 40, 41, 42, 43, 44, 45, 46, 47, 48, 49, 50, 51, 52, 53, 54, 55, 56] and various species of Tabebuia have been used for the treatment of different types of diseases, including cancer. In addition, Nirmala et al. reported that β-lapachone is now in clinical trial or drug development phase as plant derived anticancer agents. So, we were encouraged to investigate the anticancer activity of T. pallida in EAC cells-induced tumor bearing mice. Recently, our group reported that the antioxidant-rich white mulberry has anti-ROS and anticancer activity . Previously, we reported that the highest antioxidants were in the leaves of T. pallida compared to other parts (flowers, stem and root barks) of this plant . Therefore, in this study, the leaves of T. pallida were subjected to evaluate its in vitro effect on ROS and in vivo effect on cancer in EAC-induced tumor bearing mice. Leaves of T. pallida were collected from Rajshahi University Campus, Rajshahi, Bangladesh in May 2013. The plant was identified by an expert taxonomist at the Department of Botany, University of Rajshahi, where a voucher specimen (Voucher No. MN-03) was deposited. The dirty materials were removed from leaves before shaded sun drying for several days. After drying, the dried leaves were grounded to coarse powder by a grinding machine. The processed plant materials kept at room temperature (RT) for future use. The extraction procedure was performed according to Islam et al. . The dried powdered leaves (about 500 g) were soaked in an amber colored extraction bottle with 70% ethanol (1 L × 3 times) and preserved for 7 days at room temperature with occasional shaking and stirring. First cotton filtration was performed to extract and then Whatman No.1 filter paper was used. Afterwards they were concentrated with a rotary evaporator (BibbySterlin Ltd., UK) under reduced pressure at 45 °C to afford 46 g crude extract. Slurry prepared with water was taken in a separating funnel to perform partitioning with petroleum ether, chloroform, ethyl acetate and finally water. After vigorous shaking, the funnel was allowed to stand for a few minutes to obtain petroleum ether fraction (PEF, 13.51 g), chloroform fraction (CHF, 9.98 g), ethyl acetate fraction (EAF, 7.79 g) and aqueous fraction (AQF, 8.50 g), respectively. The process was repeated three times. Finally, the different fractionated parts were evaporated using rotary evaporator at 40 °C. 2,2-diphenyl-1-picrylhydrazyl (DPPH), potassium ferricyanide, catechin (CA), ferrous ammonium sulphate, butylatedhydroxytoluene (BHT), gallic acid (GA), ascorbic acid (AA), aluminum trichloride (AlCl3), trichloro acetic acid (TCA), sodium phosphate, sodium nitrate, ammonium molybdate, 2-deoxyribose, sodium hydroxide, EDTA and FeCl3 were purchased from Sigma Chemical Co. (St. Louis, MO, USA); potassium acetate, phosphate buffer, thiobarbituric acid (TBA), HCl, H2SO4, H2O2were purchased from Sigma-Aldrich, vinblastine sulphate (VBS) from Cipla India, Folin-Ciocalteu phenol reagent and sodium carbonate were obtained from Merck (Darmstadt, Germany). Total phenolic contents of the extracts were determined by the modified Folin-Ciocalteu method described by Wolfe et al. . An aliquot of the extract was mixed with 2 ml Folin-Ciocalteu reagent (previously diluted with water 1:10 v/v) and 2 ml (75 g/l) of sodium carbonate. The tubes were vortexed for 15 s and allowed to stand for 20 min at 25 °C for color development. Absorbance was then measured at 760 nm UV- spectrophotometer (Shimadzu, USA). Samples of the extract were evaluated at a final concentration of 0.1 mg/ml. Total phenolic contents were expressed in terms of gallic acid equivalent, GAE (standard curve equation: y = 0.095x + 0.097, R2 = 0.998), mg of GA/g of dry extract. Gallic acid stock solution (5 mg/1 ml methanol) was diluted in six concentrations (2.5-40 μg/ml) to obtain standard curve, where the range of absorbance values was 0.362–3.905 (Additional file 2: Figure S1). Moreover, there were four fractions of sample with the concentrations ranged from 12.5 to 150 μg/ml and the range of absorbance values was 0.103 to 3.854.The experiment was repeated three times at each concentration. Total flavonoids were estimated using aluminum chloride colorimetric assay described by Zhishen et al. . To 0.5 ml of samples/standard, 150 μl of 5% sodium nitrate and 2.5 ml of distilled water were added. After 5 min, 0.3 ml of 10% AlCl3 was added. At 6 min, 1 ml of 0.001 M NaOH and 0.55 ml distilled water was added to the mixture and left at RT for 15 min. Absorbance of the mixtures was measured at 510 nm. Samples of extract were evaluated at a final concentration of 0.1 mg/ml. Total flavonoid contents were expressed in terms of catechin equivalent, CAE (standard curve equation: y = 0.000x + 0.001, R2 = 0.998), mg of CA/g of dry extract. There were six concentrations ranged from 10 to 320 μg/ml of CA with the absorbance values ranged from 0.0046 to 0.092, respectively. The experiment was repeated three times at each concentration. Total antioxidant capacity (TAC) of the extracts was determined by phosphomolybdate method using catechin as a standard reported by Prieto et al. . The assay is based on the reduction of Mo (VI) to Mo (V) by samples and formation of green colored phosphate/Mo(V) complex at acidic pH. 0.5 ml of samples/standard at different concentrations (12.5–150 μg/ml) was mixed with 3 ml of reaction mixture containing 0.6 M sulphuric acid, 28 mM sodium phosphate and 1% ammonium molybdate into the test tubes. The test tubes were incubated at 95 °C for 10 min to complete the reaction. The absorbance was measured at 695 nm using a spectrophotometer against blank after cooling at RT. CA was used as standard. The absorbance values of the samples were 0.193–2.307 at the concentrations ranged from 12.5–150 μg/ml, respectively. A typical blank solution contained 3 ml of reaction mixture and the appropriate volume of the same solvent used for the samples/standard was incubated at 95 °C for 10 min and the absorbance was measured at 695 nm. Increased absorbance of the reaction mixture indicates increased antioxidant capacity. The ferrous reducing antioxidant capacity of extracts was evaluated by the method of Oyaizu . The Fe2+ can be monitored by measuring the formation of Perl’s Prussian blue at 700 nm. 0.25 ml samples/standard solution at different concentrations (12.5–150 μg/ml), 0.625 ml of potassium buffer (0.2 M) and 0.625 ml of 1% potassium ferricyanide, [K3Fe (CN)6] solution were added into the test tubes. The reaction mixture was incubated for 20 min at 50 °C to complete the reaction. Then 0.625 ml of 10% TCA solution was added into the test tubes. The total mixture was centrifuged at 3000 rpm for 10 min. After which, 1.8 ml supernatant was withdrawn from the test tubes and was mixed with 1.8 ml of distilled water and 0.36 ml of 0.1% ferric chloride (FeCl3)solution. The absorbance of the solution was measured at 700 nm using a spectrophotometer against blank. The range of the absorbance values of the samples was 0.033–2.943 at the concentrations ranged from 12.5–150 μg/ml, respectively. A typical blank solution contained the same solution mixture without plant extracts/standard was incubated under the same conditions and the absorbance of the blank solution was measured at 700 nm. Increased absorbance of the reaction mixture indicates increased reducing capacity. The experiment was repeated three times at each concentration. Where, A0 is the absorbance of the control, and A1 is the absorbance of the extracts/standard. Then % of inhibition was plotted against concentration, and from the graph IC50 was calculated. The range of the absorbance values of all the samples was 0.535–0.023 at the concentrations ranged from 12.5 to150 μg/ml, respectively. The experiment was repeated three times at each concentration. Where, A0 is the absorbance of the control without a sample. A1 is the absorbance after adding the sample and 2-deoxy-D-ribose. A2 is the absorbance of the sample without 2-deoxy-D-ribose. At the concentrations ranged from 12.5 to150 μg/ml, the range of the absorbance values of the samples was0.068–0.478, respectively. The experiment was repeated three times at each concentration. Where, A0 is the absorbance of the control (300 μl of distilled water), and A1 is the absorbance of extracts/standard. Then % of inhibition was plotted against concentration, and from the graph IC50 was calculated. The experiment was performed in triplicate and repeated three times at each concentration. The range of the absorbance values of all samples were 0.048–0.200 at the concentrations ranged from 12.5 to150 μg/ml, respectively. Where, Nt = Number of viable nauplii after 24 h of incubation, N0 = Number of total nauplii transferred i.e. 10. Swiss albino male mice, aged 4 weeks and weighing between 25 and 30 g, were purchased from ICDDRB (International Centre for Diarrheal Disease Research in Bangladesh), Dhaka, Bangladesh. The animals were housed in propylene cages in a controlled environment (temperature 25 ± 2 °C and 12 h dark and light cycle) and received feed formulated by ICDDRB and water ad libitum. The animals were acclimatized to laboratory conditions for 10 days prior to initiation of experiments. To keep the hydration rate constant, food and water supply were stopped 12 h before the experiments. EAC cells were obtained by the courtesy of Indian Institute of Chemical Biology (IICB), Kolkata, India. Mice were injected with EAC cells by successive transplantation of 1 × 105 cells/mouse in peritoneal cavity by needle aspiration with a volume of 0.2 ml in PBS. In vivo tumor cell growth inhibition was carried out by the method previously described by Sur and Ganguly . For this study, 6 groups of mice (6 in each group) were used. For therapeutic evaluation, 1 × 104 Ehrlich ascites carcinoma (EAC) cells /mouse were inoculated into each group of mice on the first day. Treatment was started after 24 h of EAC inoculation and continued for 5 days. Group 1 to 4 received the test compounds (EAF, AQF, CHF and PET) at the doses of 50 mg/kg, respectively per day per mouse. In each case, the volume of the test solutions injected intraperitoneally (i.p.) was 0.1 ml/day per mouse. Group 5 received standard bleomycin (0.3 mg/kg, i.p) and was considered as positive control. Finally, the group 6 mice were treated with the vehicle (normal saline) and were considered as untreated control. The mice were sacrificed on the 6th day after transplantation and tumor cells were collected by repeated i.p.wash with 0.9% saline. Viable tumor cells per mouse of the treated group were compared with those of control. Where, Tw = Mean of number of tumor cells of the treated group of mice and Cw = Mean of number of tumor cells of the control group of mice. All tests were carried out in triplicates. Data were presented as mean ± SD. Free EViews 4.1 Software and Microsoft Excel 2007 (Roselle, IL, USA) were used for the statistical and graphical evaluations. The results with a value ofP < 0 .05 were considered significant. The total polyphenol contents in the CEE and its four fractions: EAF, AQF, CHF and PEF expressed as GAE and CAE were shown in Table 1. The EAF showed the highest phenolic (158.17 ± 1.54 mg GA/g) and flavonoid (5.43 ± 0.017 mg CA/g) content among the extracts. Strong correlation (p < 0.01) of total phenolic content of the extracts with free radical scavenging efficiency and % lipid peroxidation inhibition were observed (Table 2). The TAC of CEE and its four fractions of leaves of T. pallida were shown in Fig. 1a. The total antioxidant activity of EAF was higher (p < 0.01) than all other extracts even in comparison to standard CA followed by EAF > CA > CEE > CHF > AQF > PEF. At the concentration of150μg/ml, the absorbance of CEE, EAF, AQF, CHF, PEF and standard CA were in the range of 0.901 ± 0.01–2.30 ± 0.08. Increasing the extracts concentration increased the total antioxidant activity. The ferrous reducing antioxidant capacity of CEE and its four fractions was shown in Fig. 1b. It was found that the reducing power increased with concentration of each sample. At 150 μg/ml, the absorbance of CEE, EAF, AQF, CHF, PEF and standard AA were in the range of 0.608 ± 0.005–3.22 ± 0.06. EAF exhibited very strong radical scavenging (p < 0.01) activity in comparison to other fractions but less than the standard ascorbic acid. The descending order of strength of ferrous ion reducing activity of the extracts were AA> EAF > CEE > AQF > CHF > PEF. A higher absorbance indicates a higher reducing capacity. The reducing activity was increased with the increasing concentration of the extracts. The free radical scavenging activity of CEE, EAF, AQF, CHF and PEF at a concentration of 50 μg/ml was 89.19 ± 0.60, 96.18 ± 0.16, 81.78 ± 1.25, 74.16 ± 0.66 and 26.81 ± 0.92%, respectively; while at the same concentration the activity of BHT was 95.74 ± 0.25% (Fig. 2a). The IC50 of CEE, EAF, AQF, CHF, PEF and standard BHT were 9.33 ± 0.38, 6 ± 0.25, 10 ± 0.01, 26.58 ± 0.52, 94.5 ± 1.39 and16.08 ± 0.28 μg/ml, respectively. Lower the IC50indicates higher the radical scavenging activity. The free radical scavenging activity of different extracts and BHT were in the following order: EAF > AQF > CEE > BHT > CHF > PEF. The hydroxyl radical scavenging activity of CEE of T. pallida leaves was dose dependent. Among the extracts, EAF had higher activity than that of the other extracts. At a concentration of 100 μg /ml, the scavenging activity of CEE, EAF, AQF, CHF and PEF were found to be 62 ± 0.57, 88.24 ± 0.76, 81.60 ± 0.59, 84.14 ± 0.14 and 78.53 ± 0.56%, respectively; while at the same concentration, the activity of standard AA was 80.27 ± 0.46% (Fig. 2b). The IC50 of CEE, EAF, AQF, CHF, PEF and AA were 47.25 ± 2.28, 3.58 ± 0.28, 4 ± 0.00, 4.66 ± 0.14, 7.05 ± 0.18 and 10.25 ± 0.25 μg/ml, respectively. The result demonstrates that the radical scavenging activity of EAF was higher than not only other extracts but also standard drug AA. The lipid peroxides scavenging activity of CEE of T. pallida leaves was investigated and compared with standard CA. The scavenging activity of CEE, EAF, AQF, CHF and PEF at a concentration of 100 μg/ml, were 71.57 ± 0.46, 75.87 ± 0.83, 72.02 ± 0.29, 65.67 ± 0.52 and 58.89 ± 0.36% respectively; whereas the activity of CA was 85.53 ± 1.01% (Fig. 3a). The IC50 of CEE, EAF, AQF, CHF and PEF were 20.5 ± 1.08, 14.33 ± 0.14, 22.08 ± 0.76, 25.25 ± 0.66 and 67.25 ± 1.95 μg/ml, respectively; on the other hand, the IC50 of CA was 11.46 ± 0.38 μg/ml (Fig. 3b). The EAF had the highest inhibitory activity among the extracts and almost equal inhibitory activity to that of CA. Significant correlations (p < 0.01) were observed between % lipid peroxidation inhibition and % hydroxyl radical scavenging (Table 3). The significant tumor cell growth inhibition was observed after treatment with the extracts at the dose of 50.0 mg/kg (i.p) on day six of tumor inoculation. The EAF showed maximum cell growth inhibition (71.17 ± 0.44%, p < 0.01) when compared with other extractives such as AQF (63.60 ± 0.81%), CHF (58.88 ± 0.35%) and PEF (51.94 ± 0.56%). On the other hand, standard bleomycin (positive control) at a dose of 0.3 mg/kg i.p inhibited the tumor cell growth by 83.46 ± 0.75% (Table 4). This result implies that various fractions of leaves especially EAF had considerable anticancer activity compared with the standard bleomycin and the plant might therefore be considered as an effective source of active chemopreventive agents. From therapeutical and pharmaceutical point of view, plants are still considered as a great source of novel medicinal principles for new drug discovery. So, the possibility of getting pharmacologically active compounds is high from traditional and native medicinal plants. Thus, phytochemical investigation of the plant species is of eminent importance. Therefore, the assessment of the antioxidant, cytotoxicity, and anticancer potential of traditional medicinal plants by using safe and easy assay method may serve as an efficient tool for the chemical identification of active molecules which may be used as antioxidant as well as anticancer compounds; or lead compounds which could be chemically modified to effective chemotherapeutic agents such as antioxidant or anticancer drugs. These drugs could be used to manage different diseases as well as slow down cancer growth or even cure cancer and consequently contributing positively to safety of human life as well as the economy of the country and the world at large. Polyphenols are the foremost antioxidants found in plant kingdom, which have anticancer property . It is believed that antioxidant properties of the polyphenolic compounds are mainly for their redox capacity, which neutralizes the free radicals . In addition, flavonoids which are also present abundantly as secondary metabolites in plant showed potential antioxidant, antimutagenic, and anti-malignant effects . Besides, the chemo-preventive role of flavonoids is due to their signal transduction in cell proliferation followed by angiogenesis . In our study, the results showed that the leaves extracts especially EAF contains significant amount of phenolic and flavonoid compounds (Table 1). Thus, our findings indicate that these polyphenolic compounds are the vital components of this plant, and it can be assumed that the presence of such constituents may play an important role for pharmacological effects like anticancer activity. The total antioxidant potentials of leaves extracts were determined by their ability to reduce the reduction of Mo (VI) to Mo (V) followed by the formation of a green complex [phosphate/Mo (V)] at acidic pH. To show antioxidant activity the abundance of bioactive compounds in the extract is more significant. As extracts with higher concentrations shows higher antioxidant activity. In our experiment, the higher concentration of extracts showed higher antioxidant activity with a reducing ability range between 0.19 ± 0.005 to 2.30 ± 0.008 μm of green phosphate/Mo (V) (Fig. 1a). The antioxidant activity of EAF was significantly higher (p < 0.01) than the standard antioxidant. Furthermore, our results were consistence with the data published previously  and revealed that the antioxidant capacity is due to the presence of polyphenol contents in the extracts. In order to evaluate the antioxidant activity of plant extract, reducing power determination is widely used which exert antioxidant action by breaking the free radicals. In this assay, the polyphenolic enriched-antioxidant sample causes the reduction of the Fe3+ /ferricyanide complex to the Fe2+/ ferrous form where the reducing power is measured at 700 nm after the formation of blue complex of Perl’s Prussian . In our study, the iron reducing capacity of CEE, EAF, AQF, CHF and PEF was evaluated from their reducing ability where they showed the activity with a range of 0.033 ± 0.002–2.94 ± 0.036 μm of Fe (II)/g (Fig. 1b) and the reducing activity was increased with concentration dependent manner (Fig. 1b). Thus, it can be revealed that the presence of polyphenols is attributed to the antioxidant activity and reducing power capacity. DPPH free radical scavenging is a well-established experiment for screening the antioxidant activity of plant extracts. In this assay, violet color DPPH solution is reduced to the yellow color of diphenylpicryl hydrazine after adding the extracts in a concentration dependent manner. This method now a day is very popular to predict the antioxidant activities due to its accuracy and short timing for assay. All the fractions of T. pallida leaves extract exhibited better DPPH radical scavenging activity with the increase of concentration (Fig. 2a). The IC50 of EAF was significantly lower (p < 0.01) than that of other fractions and the standard BHT. The inhibitory activity of the extracts was found to be as following order EAF > AQF > CEE > BHT > CHF > PEF. Previously, it has been reported that hydrogen donating ability of phenolics, flavonoids and tocopherols is the main factor to reduce the DPPH radicals [74, 75]. Therefore, this study revealed that T. pallida leaves act as free radical scavengers by reducing DPPH radicals that might be through hydrogen donation. Breakdown of DNA basically involves in the mutagenic capacity of free radicals where hydroxyl radicals directly interact with DNA and finally trigger the cancer formation . Usually, hydroxyl radicals can be generated by biochemical reaction in the presence of superoxide dismutase and divalent metal ions, such as iron and copper. Our results demonstrated that all the fractions of leaves extract had higher hydroxyl radical scavenging activity compared with standard antioxidant BHT. Among the fractions and standard antioxidant, EAF showed the highest scavenging activity (Fig. 2b) and may serve as anticancer agent by inhibiting the interaction of hydroxyl radical with DNA. Lipid peroxidation refers to the chain reaction where ROS induce membrane damage by peroxiding lipid moieties  that lead to functional abnormalities of cells. Lipid peroxidation has been reported to be elevated in the cancer . In vitro lipid peroxidation was induced in rat liver by generating OH radical through Fenton’s reaction in presence of ferric ion and potassium chloride. In respect to antioxidant activity, inhibition of lipid peroxidation is considered the most important index. In this study, the CEE of leaves and its four fractions especially EAF exhibited potential inhibition of lipid peroxidation (Fig. 3a). The lipid peroxidation inhibition was significantly correlated with hydroxyl radical scavenging (Table 3). This result indicates that the leaves extracts can inhibit lipid peroxidation differentially by varying capacity of free radical quenching potential and may be used to treat several diseases caused by free radicals. The cytotoxic effect may be due to the presence of diverse phytochemicals such as saponins, triterpenes, tannins and polyphenolic compounds in the extract and this phytochemical compound exist in plants exhibited anti-tumorigenic effects via multiple anticancer pathways . It has been reported that polyphenolic compounds have a correlation between cytotoxic activity and antioxidant property . Among the tested fractions of T. pallid leaves especially EAF showed (Fig. 4a and b) the highest cytotoxic properties which was significantly correlated (p < 0.01) with polyphenol compounds and antioxidant properties that comply with the data published elsewhere . This result suggests that all the extracts showed cytotoxicity due to the presence of bioactive compounds which might have anti-tumor effect. In vivo, oxygen is the most common form of free radicals. When an oxygen molecule (O2) becomes electrically charged or radicalized, it damages the DNA that lead to various diseases, including cancer. On the other hand, antioxidants are often neutralizing the electrical charge and prevent the free radical to damage the cell and thereby prevent various diseases, including cancer. Literature review on different chemical, cell culture, and animal studies suggest that antioxidants may prevent or slowdown the development of cancer . In this study, the anticancer activity of T. pallida leaves on EAC-induced cancer in mice was in moderate level when compared with the standard bleomycin (Table 4) that makes it as a good candidate for isolating anticancer agent. The present study indicates that T. pallida leaves possess significant polyphenolic contents, which exhibited strong ROS scavenging activities. The leaves also showed strong cytotoxic effect and moderate anticancer activity. Tabebuia genus is enriched with a diverse class of chemical compounds (Additional file 1: Table S1) based on literature survey and in our study, the resulting bioactivities are basically responsible for mixture of phytochemicals possess in the extracts or may be due to the synergistic activity of various constituents retain in this plant species. Further investigation is being carried out to identify and characterize the inherent phenolic compounds as well as bioactive compounds of the plant which are responsible for the antioxidant, cytotoxic effect and anticancer activities from the ethyl acetate fraction of T. pallida leaves. The authors acknowledge the Bangladesh Council of Scientific and Industrial Research (BCSIR) and Department of Pharmacy, University of Rajshahi for their all logistic support. We also thank Dr. AHM Mahabubur Rahman, Associate Professor, Department of Botany, University of Rajshahi for the identification of the plant. We thank Ridita Mizan, Lecturer, Department of English, Rajshahi University, Bangladesh for correcting grammatical errors. This work was carried out with partial funding by the DSR of Imam Abdulrahman Bin Faisal University project no 2018–090 irmc. All authors read the manuscript and approved it for submission. No part of the manuscript has been published before, nor is any part of it under consideration for publication at another journal. MMR: Executed the experimental works according to study design. ASMSH: Analysis and acquisition of data. MGM: Performed anticancer study. MAK: Carried out the lipid peroxidation inhibition assay. RA: Performed in vitro antioxidant work. AM: Checked the initial draft of the manuscript. MGS: Checked the final manuscript. AHMKA: Supervised and designed the study as well as drafted and corrected all versions of the manuscript. All authors read and approved the final manuscript. Protocol used in this study for the use of mice as animal model for cancer research was approved by the Rajshahi University Animal Ethical committee (27/08/RUBCMB). This research work was approved by Ethical Review Committee of Research Cell of Rajshahi Medical College, Bangladesh (ref. RMC/ER/2010–2013/01) under the guidelines of National Research Ethics Committee (NREC) of Bangladesh, which follow the protocols of National Health Act No. 61 of 2003, Government of Canada Interagency Advisory Panel on Research Ethics (PRE) and the Declaration of Helsinki.